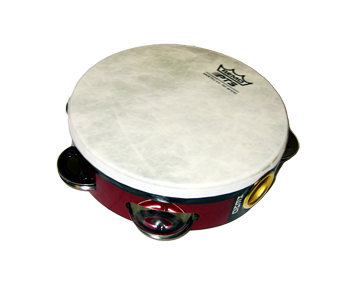 6" red tambourine with quality Fiberskyn head for drumming. This pre-tuned wooden tambourine features 4 sets of secured metal jingles that provide a crisp ringing sound. This headless plastic tambourine with four jingles is a delight to play. Easy-to-hold handle and 6” x 6” x 1” size make it perfect for little hands. 8" plastic tambourine without drum head. 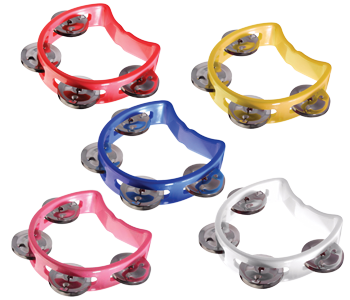 This robust tambourine is ergonomically-designed and features a solid gripping area, easy manipulation and 7 sets of secured metal jingles that provide a crisp ringing sound. 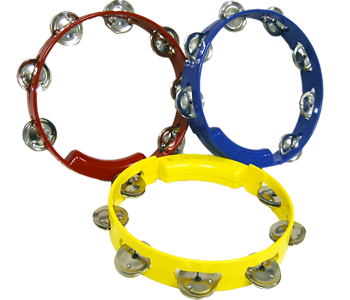 These tambourines have a patented jingle-pinning system that keeps the jingles in place.